Funga Alafia, Children are the future, if we have the time. Also remember to memorize the lyrics to ALL OF YOUR SONGS, as we will not have our music sheets with us in the concert. Below are some new videos! Check them out! Apologies for the poor audio, I hope they will help you to practice. AUDIO FOR THE SONGS WE ARE LEARNING - PRACTICE AT HOME! LYRICS ... print these out at home and practice. Rehearsal dates are below - from 3pm - 4:30pm (please note change in times). Rehearsal pieces subject to change without notice. REMEMBER THE HIGH EXPECTATION of commitment, enthusiasm, respect and co-operation - your child's place in the choir is entirely dependent on their demonstration of these attitudes during rehearsals, as well as attendance on time every week. If you're not committed, then your spot may be given away! February 9, 10, or 11 (details TBA) morning rehearsal with ESF choir director. 4th of March 2015, morning - all ESF rehearsal... details to be submitted..
ESF Primary School's Choral concert on the 20th of March 2015. Rehearsal will be held in the PAC Auditorium (unless stated above) Please ask your child to wait OUTSIDE the PAC until it is time for rehearsal. When rehearsal is not in the PAC, there will be signs and students at the front of the line to help guide you where to go. Rehearsal starts promptly as soon after 3pm as possible and students will be dismissed at 4:30pm. 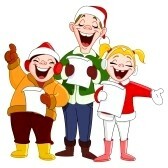 In order for the choir to run smoothly, please email student absences to me before lunchtime on the day of rehearsals . Also, please note that pick up is at 4pm. One Voice is an auditioned singing group for years four to six students. In order for the choir to run smoothly, please email student absences, tardies, or needs to be dismissed, before lunchtime on the day of rehearsals (or the day before, if possible). Failure to do so will result in an unexcused absence. More than two unexcused absences or 4 excused absences may result in removal from the choir. Also, please note that pick up is at 4:30pm. The Primary Choral Concert will be held on Thursday, 27th November 2014. Children will need to arrive at 5.20 pm to prepare. Junior and Senior Primary singers should come to the Back Box Theatre opposite my Music room . The concert will be held in the PAC and will start at 6pm. Between 3.00pm- 5.20 pm, it is vital that students are supervised by their guardians. Dress is red, white and/or black. Students are welcome to wear a festive accessory like a santa hat. On Tuesday, 25th December, there will be a walk through rehearsal (STUDENTS ONLY) from 3.05pm-4pm. It is important that students arrive at the PAC as soon as possible after they are dismissed from class. I will meet them there. If a student is unable to attend, please can you let me know via email.